The principal of Hudson Marine is a former Navy Salvage and Diving Officer. Our knowledge of marine architecture and salvage techniques made it possible to raise a large caisson without damaging the structure. 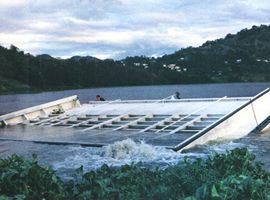 The caisson pictured above sunk in a remote reservoir in Puerto Rico where heavy lift equipment could not be brought in. The salvage plan and engineering calculations provided by Hudson Marine resulted in a successful recovery.